This week Sara talks with Dr. Mimi Sheller, Director of the Center for Mobilities Research and Policy and Professor of Sociology at Drexel University. Dr. Sheller’s most recent book - “Mobility Justice: The Politics of Movement in an Age of Extremes” - serves as the backdrop of this conversation about centering our own advocacy on the intersections of power, inequality, transportation, climate action, and justice. Pick up a copy of Dr. Sheller’s book here: https://goo.gl/CAqCbQ. Sara and Kyle tag-team this week’s interview with Kate Gasparro, PhD candidate at Stanford University. Kate recently completed her dissertation defense focusing on research comparing stakeholder dynamics across cities where crowdfunding was used as part of innovative bicycle infrastructure project delivery. Kate’s work and research offers insights into how crowdfunding public infrastructure develops partnerships and creates an engaged stakeholder base, but doesn’t serve as the sole determinant of success for a project. Visit Kate’s website for more information about her work and research: www.kategasparro.com. This week Kyle is joined by Melissa Balmer, Founder and Director of PedalLove.org - a non-profit cultivating the power of storytelling to elevate the voice and impact of women for creating more active, mindful mobility for everyone. Melissa discusses the role of storytelling in advocacy, provides examples for how personal narratives can combine with data, and provides context for stories play in diversifying the representation of participants making change around the world. Melissa and co-author Jay Walljasper will release their new book “The Surprise Promise of Bicycling for America” later this spring https://goo.gl/ep1UTX. The Bike Nerds kick off 2019 with a bang! Sara is joined by Carolyn Finney, assistant professor of geography at the University of Kentucky and author of “Black Faces, White Spaces” (https://goo.gl/ZsemNT) to discuss the how identity and representation influence participation in outdoor recreational activities by people of color. Carolyn was a lead organizer of REI’s “5 Ways to Make the Outdoors More Inclusive” (https://goo.gl/oKeWgX), a detailed step-by-step action plan for making our public spaces accessible and culturally relevant to everyone. Touch base with the Bike Nerds on Twitter, Facebook, or email to leave your feedback. Even better - leave a review on iTunes! The Bike Nerds Podcast is sponsored by Bike Fixation by Saris. Visit www.bikefixation.com/bikenerds for a full array of bicycle parking and infrastructure products. 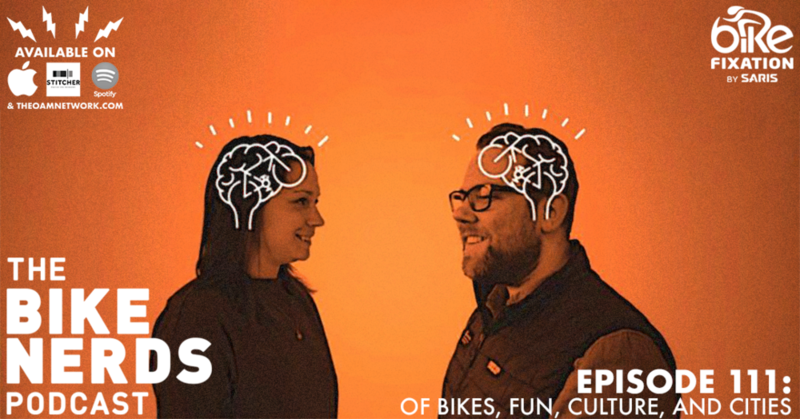 Sara and Kyle reflect on a busy 2018 - taking note of the amazing guests and breadth of topics covered in the third year of Bike Nerds podcasting. Sara kicks off the show with big announcement, Kyle still like Star Wars, and the episode concludes with a montage of 2018’s best guests and moments. Happy holidays to all out great listeners! We’ll nerd out more in the New Year! his week, Sara and Kyle are joined by BNP superfan - Barb Chamberlain! Barb currently works as the Director of the Active Transportation Division at Washington State Department of Transportation (WSDOT), but has a storied career and legacy of public service first as an elected official and later staffing bicycle advocacy organizations across the Pacific Northwest. Barb and the Bike Nerds talk about Twitter as an archive of online notes; Barb reflects on her time as an elected official drawing comparisons to women being elected today; and Sara gets to the bottom of what it means to be an “advocrat” working at a state-level DOT. Kyle is joined this week by Martha Roskowski, a legendary figure of bicycle advocacy with experience at every level - local, state, and nationally - working to make bicycling better. Last year, Martha was presented with a new opportunity to dive deep into a policy issue that impacts bicycling everywhere: PARKING (for cars). Her year-long research included interviews with people on the front lines of advocacy and development to paint a picture of how making space for parking is driving how cities develop and limiting our ability to make room for modes of transportation beyond cars. Fresh off their recent visit to New Orleans, the Bike Nerds welcome Rich Neimand, President of social impact marketing firm Neimand Collaborative. Rich and his team recently helped conduct and analyze a research project commissioned by PeopleForBikes to better understand how bicycle advocates can use public communications and messaging tools as a way to build broader support for implementing bicycle infrastructure. Kyle sat down with Rich following the conclusion of their presentation at the Walk Bike Places 2018 conference and got all of the highlights for the Bike Nerds’ listeners. Additional information and resources can be accessed at peopleforbikes.org/activatingsupport. That’s it listeners - we’re officially 100!! Thanks for hanging with us these past three years and a big shout out to our friends, listeners, and new members of the bike nerds family that joined us in New Orleans to record this momentous occasion. In true sub-optimal Bike Nerds fashion, we had some weird technical problem on one of the mics that comes and goes as a slight echo throughout the episode - sorry. We make up for it with jokes, laughter, and stories from our guests about what the podcast means to them. Sara is joined this week by Michelle Poyourow, Senior Associate at Jarrett Walker + Associates to discuss the changing nature of modality in cities, how the concept of “shared” or “public” space is both the challenge and the opportunity for city builders, and the role that “change” plays in motivating local behaviors and perceptions when presented with an idea to create more complete streets. In the build up to the 100th episode, the Bike Nerds are seeking listener feedback on the show - they want to read your comments live on the air! Also, if you’ve got an idea for a closing tag line, the Bike Nerds want your suggestions and will pick a winner from listener feedback. Touch base with the Bike Nerds on Twitter, Facebook, or email to leave your feedback. Even better - leave a review on iTunes! Sara takes point this week talking with Jordan Lee Miller, Chair of Bike Camden County (NJ), an official affiliate group of the Bicycle Coalition of Greater Philadelphia. Driven by a personal passion for cycling, Jordan volunteers his time as chair to help make cycling a normal activity - utilizing strategies from successful cycling programs around the country like social rides, bike share pilots, and place-based advocacy. In the build up to the 100th episode, the Bike Nerds are seeking listener feedback on the show - they want to read your comments live on the air! Also, if you’ve got an idea for a closing tag line, the Bike Nerds are seeking suggestions from listeners and will pick a winner. Touch base with the Bike Nerds on Twitter, Facebook, or email to leave your feedback. Even better - leave a review on iTunes! Sara takes the helm this week while Kyle is away bicycling his way through the Netherlands. Special guests, Liz Cornish and Jed Weeks from Bikemore, Baltimore’s bicycle and transportation advocacy group, join Sara for a discussion about Baltimore’s challenges, the changing role of Bikemore in the city’s advocacy landscape, and how local bike advocacy organizations across the country can become more effective by moving past bikes. Kyle bring on a special co-host this week to talk about a recent project PeopleForBikes launched earlier this month - the PlacesForBikes City Ratings. Dr. Jennifer Boldry, past Bike Nerds guest and Kyle’s office-mate at PFB, joins Kyle in a Q&A discussion about all the nerdy data details this new resource helps us understand about how U.S. cities are progressing at becoming better place to bike. Buckle in and be prepared for a long talk about statistical data, regression curves, and data normalization on this one, folks! Sara’s busy launching a bike share system in Memphis and leaves Kyle alone to helm the podcast this week. Not wanting to make this week a monologue on bicycles, Kyle recruits the help of long time friend of the podcast, Chris Johnson, Walk San José Program Manager. Returning to the podcast for the first time since leaving his position at Executive Director at Bike Fort Collins, Chris comes ready to talk PeopleForBikes’ new City Ratings, autonomous vehicles, policy versus practice, and the difference in biking and walking advocacy (so far). Spoiler free mini-discussion of the upcoming Star Wars film, Solo, and recent viewings of Avengers: Infinity War end the episode.